Live Well. Eat Well. Karoo. Karoo is scientifically formulated, super-premium nutrition that caters for the advanced needs of dogs at every life-stage. Feeding age and breed-appropriate Karoo, in the correct daily amounts, is crucial to your dog’s health and condition. When they’re young it supports their development. When they reach their peak , it helps maintain their physical well-being and when they enter their senior years, it helps to counter the natural effects that comes with ageing. We’ve broken down the benefits of each Karoo product in detail according to the life-stage and breed that each is intended for. All puppies need to be fed according to their eventual adult weight. If you’re unsure of the eventual adult weight of your puppy, search for the breed or similar sized breeds on the internet. KAROO PUPPY can be used to feed highly active, lactating or pregnant dogs. Under these circumstances, dogs require more nutrients, fats and proteins and KAROO PUPPY can provide this much needed, richer diet. Always be sure to consult the daily feeding guide (found on all Montego packaging) to ensure that you are not over/underfeeding your fur families. KAROO ADULT’S formulation ensures that every bowl sustains the energy of a fully-grown dog, as well as contributing to overall conditioning, health and immune-system support at the peak of their physical development. When dogs reach senior age, their metabolisms slow down, as do their activity levels. It is important to keep in mind that the larger the breed, the earlier you should switch to a senior diet. Nutrition is significant at this stage and plays a vital role in maintaining the health, longevity and quality of life of your companion. 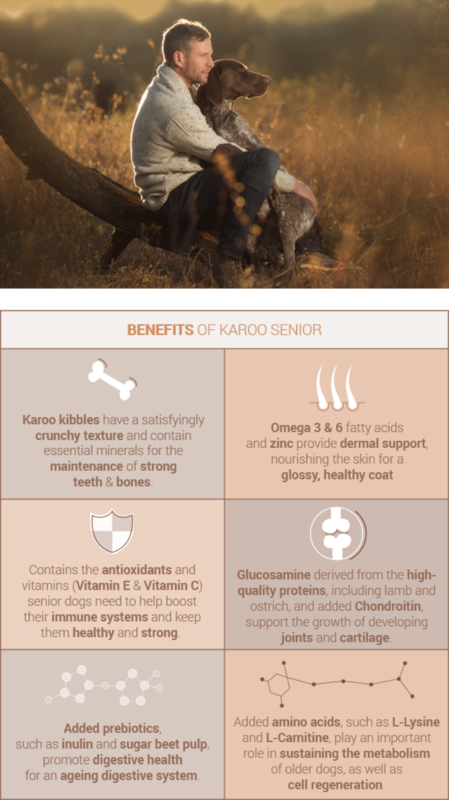 Karoo Senior’s precise formulation and superior ingredients make Montego Karoo the premium choice for your senior dog. Both adult and senior dogs must be fed according to their current healthy weight. Should your dog be overweight, the portions must be adapted accordingly. If your dog requires weight gain, be careful not to overfeed. Should you have any questions surrounding the daily feeding of your dogs, feel free to send us a message.